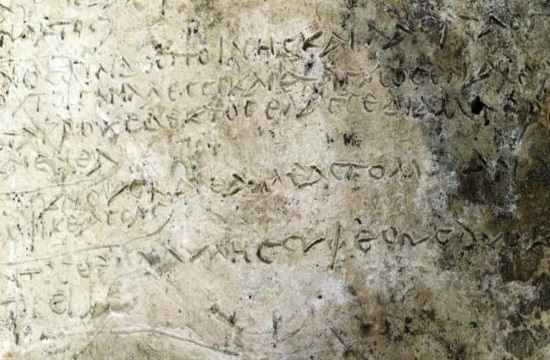 After three years of excavations around the sanctuary at Ancient Olympia, archaeologists unearthed a clay slab with of 13 verses from the epic Homeric poem “Odyssey” . According to initial estimations by experts, it is dated to the Roman era, probably before the 3rd century. A.D. They even point out that if the preliminary dating is confirmed after the systematic study of the inscription that is underway, it will most probably be the oldest written extract of the Homeric Epics that has come to light and will be one of the most significant and unique archaeological, epigraphic, literary and historical finds. The Greek Ministry of Culture issued a statement explaining the importance of the find. “After three years of research in areas around the sanctuary in the archaeological site of Ancient Olympia, archaeologists found themselves in front of a particularly important discovery” the Ministry said. A clay slab with an inscription that has been found to preserve 13 verses from rhapsody “ξ” of the Odyssey. The fragment is from Odysseus’ speech to Eumaeus. In Odyssey, Eumaeus is Odysseus’s swineherd and friend. In Homer’s epic poetry, Eumaeus is the first mortal Odysseus meets after his return to Ithaca. The piece of clay was found in an area with remains of the Roman times. The discovery was made during a surface – geo-archaeological research, within the framework of the three – year research program titled “The Multidimensional Site of Olympia”, which takes place in places around the sanctuary under the direction of Dr. Erophilis-Iris Kolia, Head of the Archaeologic Eforia in Ileia, in collaboration with Professors Franziska Lang, Birgitta Eder, Andreas Vött and Hans-Joachim Gehrke of the German Archaeological Institute and the Universities of Darmstadt, Tübingen and Frankfurt am Mainz.